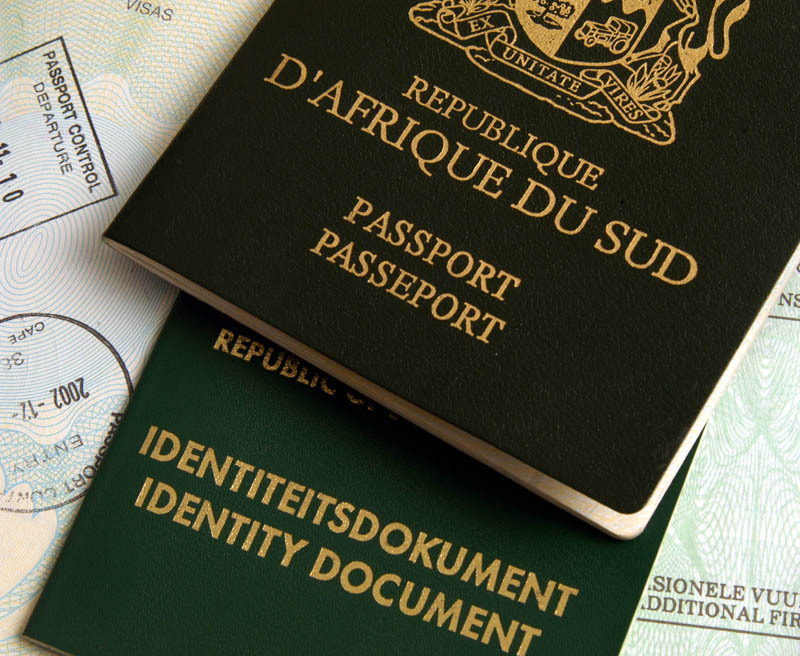 An identity document (ID) enables South African citizens and permanent residents to identify themselves for general purposes and day-to-day activities in society. IDs form an important part of each person's daily activities since all transactions require positive identification. Form BI-9, completed in black ink. A certified copy of your birth certificate or reference book or a copy of the old Transkei, Bophutatswana, Venda or Ciskei homelands identity or travel documents. Your fingerprints will be taken by a Home Affairs official and imprinted on Form DHA-9. Your naturalisation certificate and a copy, which will be certified by Home Affairs. Your permanent residency certificate and a copy, which will be certified by Home Affairs. Your exemption certificate and a copy, which will be certified by Home Affairs. Form BI-1620, which must be completed at a Home Affairs office. If the permanent residence permit or exemption certificate cannot be furnished, Form BI-829 must be completed for the issuing of a duplicate thereof. If the naturalisation certificate cannot be provided, you must apply for a duplicate prior to submitting the ID book application. In the event that your ID is lost, damaged or stolen, you may request a Temporary Identification Certificate (TIC). This can be done at any office of the Department of Home Affairs and is subject to the verification of your fingerprints. Your personal details have changed. Your citizenship status has changed. You have changed your surname (for example, if you get married or divorced). You are temporarily living abroad and have previously had a South African ID. Completing Form BI-9 as well if you have not previously submitted your fingerprints. Attaching additional documents as required (e.g. a marriage certificate if you are married). Paying the required fee for the re-issue. Be sure to provide your cellphone number in your application so that you can receive regular updates on the progress of your application via SMS. To get the SMS updates, simply SMS the word “ID” followed by your ID number to 32551. You will be charged R1 for each SMS sent. 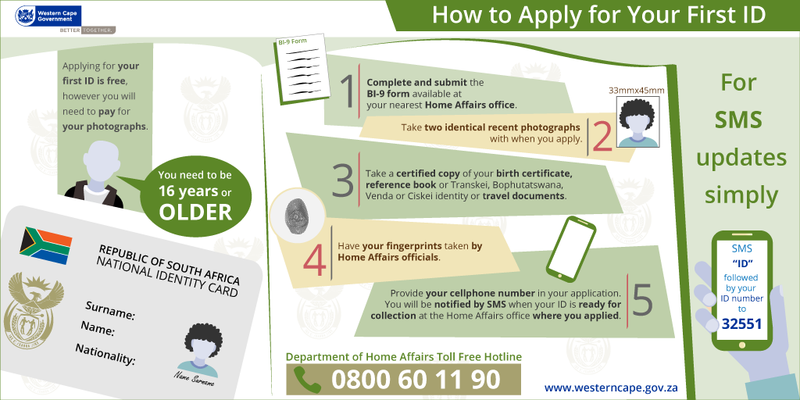 For more information on how to apply for an identity document, visit the Department of Home Affairs website, where you can also track and trace the progress of your ID application. 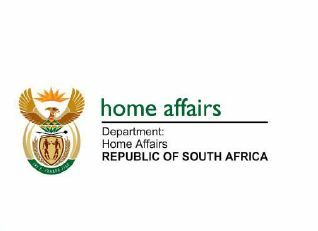 If you get your ID and there are errors, the Department of Home Affairs will replace your ID for free. Note: No application forms may be downloaded from the Home Affairs website, so you'll need to visit your nearest Western Cape Home Affairs office to get one of these. Smart ID cards, which are set to replace the green, bar-coded ID books, were rolled out in 2014 and are currently only available to first-time applicants who are 16 years and older, and pensioners over sixty years. Of the 403 home affairs offices countrywide, 110 have a “live capture” system for processing smart card IDs and new passports. By March 2015 it was expected that 140 offices would have the new technology. The smart card IDs could only be issued at offices where the new live capture system was in place. This had resulted in long queues at some of these offices. If you are a youth or a pensioner older than 60, you will be able to apply for the smart ID card at Home Affairs kiosks or your nearest bank from April 2015. All other South Africans will be invited to apply during the later phases of the roll-out. You will not need to bring photos as the offices equipped to handle applications for the smart ID card will be able to cater for both processes. Note: The old green ID books will remain valid as it is estimated that it would take six to seven years to phase them out. For more information on smart ID cards, please refer to these frequently asked questions. Note: The cost for applying for an ID does not include the cost of photographs.